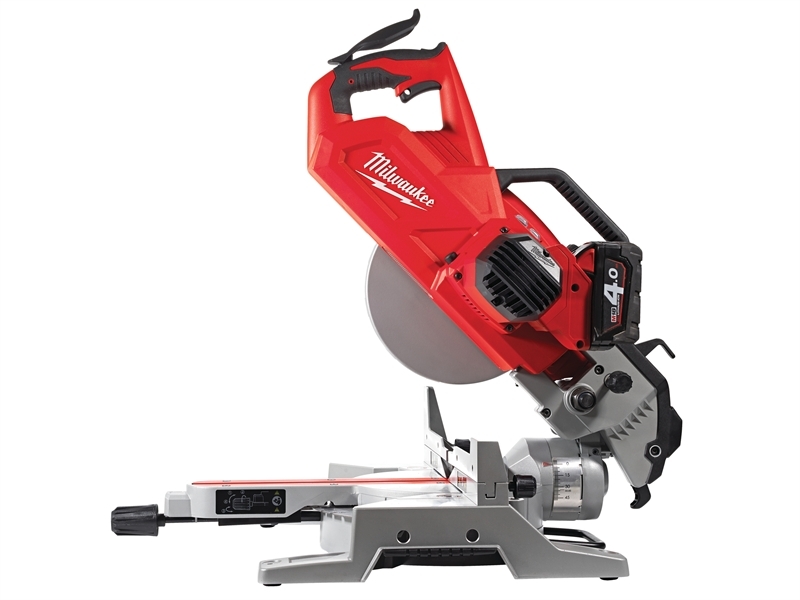 The Milwaukee M18SMS216-0 Cordless Slide Mitre Saw uses a 2-pole frameless motor to deliver 2,700 rpm for fast cutting whilst the heavy-duty cast base and fence ensures durability and accuracy. It is fitted with a spindle lock, for quick and easy blade change with a 48°/-2° bevel capacity. The saw delivers accuracy and durability with its dual vertical steel rails with linear bearings, which deliver a smooth sliding action. The rail lock, locks the saw head in the back position automatically and the mitre release system provides a quick and smooth change of the cutting orientation. The saw uses REDLINK™ overload protection electronics in tool and battery pack to deliver best in class system durability. It has a steel detent plate with preset angles that gives repeatable accurate cuts and the lock lever/handle over mould allows the user to make repeated cuts comfortably and without fatigue. It has an adjustable laser for perfect and quick alignment to cut line and an integral LED jobsite light illuminates the work area. It is supplied with a saw blade (48 teeth), blade spanner and a work clamp. Cutting Capacity 45˚ Mitre/45˚ Bevel: 190 x 48mm. Cutting Capacity 45˚ Mitre/90˚ Bevel: 190 x 60mm. Cutting Capacity 90˚ Mitre/45˚ Bevel: 270 x 48mm. Cutting Capacity 90˚ Mitre/ 90˚Bevel: 270 x 60mm. Sound Power Level: 101 dB(A). Sound Pressure Level: 88 dB(A). Vibration Sawing of Wood: 1.9 m/s². Vibration Sawing of Wood Uncertainty: 1.5 m/s².